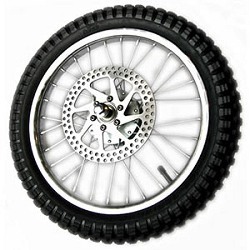 Browse for electric dirt bike wheels by vehicle make and model. Front wheel for version 1-8 Razor® Dirt Rocket MX350 electric dirt bike. Includes heavy-duty aluminum alloy rim, wheel bearings, inner bearing spacer, axle with mounting hardware, and 12-1/2"x2-3/4" knobby tire and tube. Replacement front wheel for version 1-8 Razor® Dirt Rocket MX350 electric dirt bike. Front wheel assembly for version 9+ of the Razor® MX350 Dirt Rocket and version 1+ of the Razor MX400 Dirt Rocket electric dirt bike. Includes heavy-duty spoke rim, wheel bearings, inner bearing spacer, axle with mounting hardware, and 12-1/2"x2-3/4" knobby tire and tube. Replacement front wheel for version 9+ Razor® Dirt Rocket MX350 electric dirt bike. 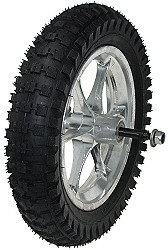 Rear wheel for version 1-8 Razor® Dirt Rocket MX350 electric dirt bike. Includes heavy-duty aluminum alloy rim, 2-1/2"x2-3/4" knobby tire and tube, 72 tooth chain sprocket with freewheel clutch, wheel bearings, band brake, axle spacers, and axle with mounting hardware. Works with 12-1/2"x2-1/4", 12-1/2"x2-1/2", and 12-1/2"x2-3/4" tires and tubes. Replacement rear wheel for version 1-8 Razor® Dirt Rocket MX350 electric dirt bike. Rear wheel for version 9+ Razor® Dirt Rocket MX350 electric dirt bike. Includes	heavy-duty spoke rim, 2-1/2"x2-3/4" tire and tube, 72 tooth chain sprocket with freewheel, band brake, wheel bearings, axle spacers, and axle with mounting hardware. Replacement rear wheel for version 9+ Razor® Dirt Rocket MX350 electric dirt bike. Complete front wheel assembly for all versions of the Razor® Dirt Rocket MX500 and MX650 electric dirt bike. 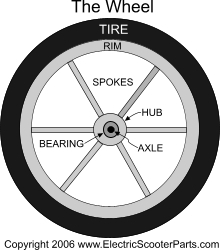 Includes heavy duty spoke rim, tire, tube, disc brake rotor, wheel bearings, and axle with mounting hardware. 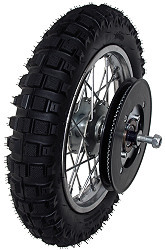 Replacement rear wheel for Razor® Dirt Rocket MX500 and MX650 electric dirt bikes. 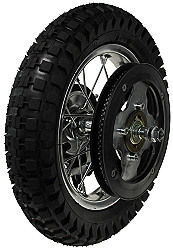 Rear wheel for all versions of the Razor® Dirt Rocket MX500 and MX650 electric dirt bike. Includes heavy-duty spoke rim, 2.50-10 knobby tire and tube, 80 tooth chain sprocket with freewheel clutch, disc brake rotor, wheel bearings, axle spacers, and axle mounting hardware. Features a tough aluminum alloy outer rim with heavy-duty steel spokes to handle the extra weight of the battery pack and rider.